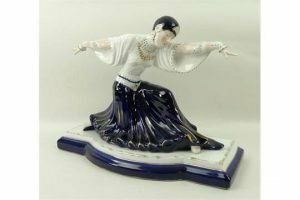 A Sevres style porcelain figure of a dancer modelled in out swept pose, blue and white with gilt highlights. 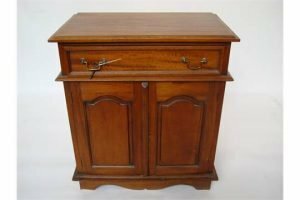 A modern hardwood side cabinet with single drawer above a pair of panelled cupboard doors. 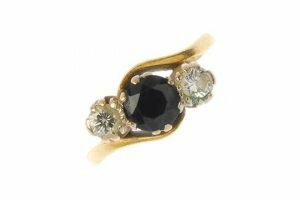 An 18ct gold sapphire and diamond three-stone crossover ring, the circular-shape sapphire and brilliant-cut diamond diagonal line, to the asymmetric sides and plain band. Estimated total diamond weight 0.30ct. Hallmarks for Sheffield, 1982. 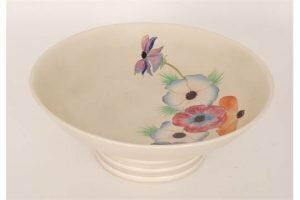 A large late 1930s Clarice Cliff bowl of shallow circular form raised to a collar foot, hand painted in the Anemone pattern with flowers and foliage over a mushroom glazed ground. 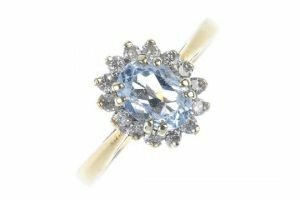 An 18ct gold aquamarine and diamond ring, the oval-shape aquamarine within a brilliant-cut diamond surround, to the tapered band. Estimated total diamond weight 0.15ct. Hallmarks for London. 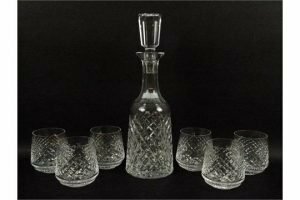 A Waterford wine decanter and stopper, and six roly poly glasses decorated in the Alana pattern. 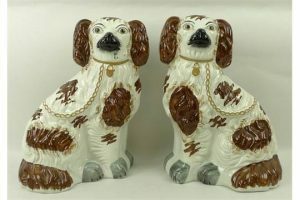 A pair of Staffordshire pottery spaniels, late 19th century, modelled with brown markings. 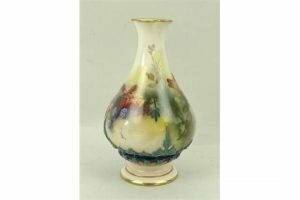 A Hadley’s Worcester porcelain vase, of baluster form with a quatrefoil rim, painted with Autumn fruits and leaves and a dragonfly. 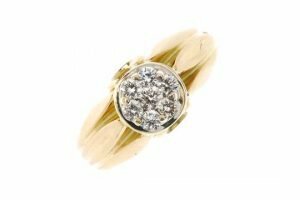 A diamond cluster ring, the brilliant-cut diamond cluster to the raised grooved sides and grooved band. Estimated total diamond weight 0.50ct. 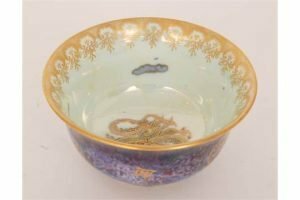 A 1920s Wedgwood lustre footed bowl, the interior decorated with a curled dragon against a pearlescent ground, the exterior in a mottled purple with gilt outlines of a bat, swallow and a tiger, printed Portland Vase mark. 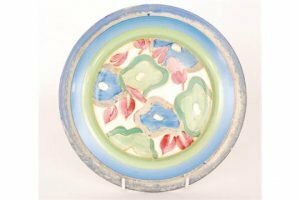 A Clarice Cliff circular side plate circa 1934, hand painted in the Blue Chintz pattern with stylised flowers and foliage within graduated blue to green banded borders. 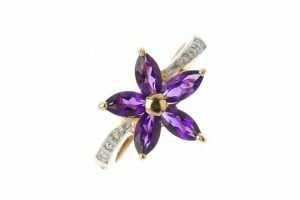 A 9ct gold amethyst floral ring, designed as a bead within a marquise-shape amethyst petal surround, to the diamond accent sides and plain band. Hallmarks for Birmingham. 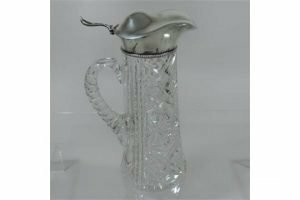 A continental silver mounted cut glass claret jug, the hinged lid with a pierced thumb piece, the tapered body with hobnail cut decoration. 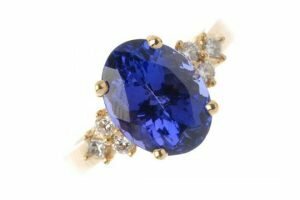 An 18ct gold tanzanite and diamond ring, the oval-shape tanzanite with brilliant and square-shape diamond trefoil sides. Estimated total diamond weight 0.25ct. Hallmarks for Sheffield. 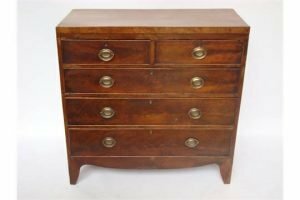 An early 19th Century mahogany chest of drawers, with two short and three graduated long cockbeaded drawers with later oval brass handles, on bracket feet. 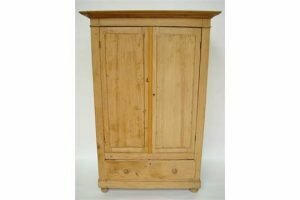 A Victorian pine wardrobe, with two panelled doors enclosing a hanging rail above a long drawer. 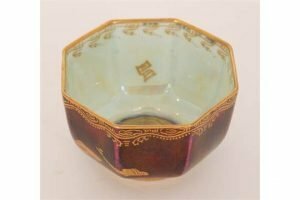 A 1920s Wedgwood lustre octagonal bowl, the interior decorated with a central roundel with Chinese characters to the side walls, the exterior in a mottled purple with gilt fish, printed Portland Vase mark. 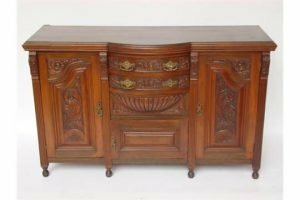 A late Victorian foliate carved walnut sideboard, with two central bowfront short drawers above a small cupboard, flanked by a pair of panelled cupboard doors enclosing shelves. 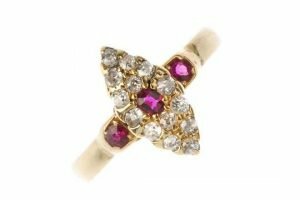 An early 20th century diamond and ruby dress ring, the oval-shape ruby and old-cut diamond marquise-shape cluster to the similarly-set ruby shoulders and replacement band. Estimated total diamond weight 0.25ct. What Is Probate? 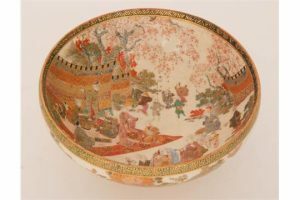 Info & probate help!